This is your chance to tell us what works, what doesn’t work, and what needs to change in the healthcare system. We want stories about how you’ve gotten healthy, the challenges you face every day, or the resources you wish you had. By sharing your ideas, you’re becoming part of the solution. We’ll regularly select great ideas from this page and repost them on our blog. Your ideas are the fuel that will keep this blog moving forward. If you have an idea, we’d love to share it. 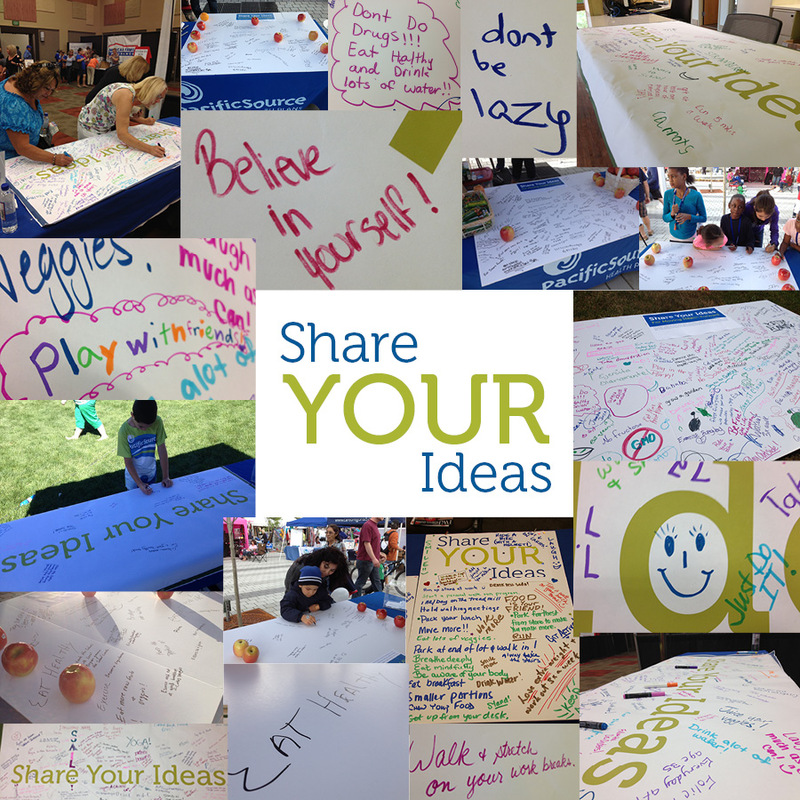 To share your idea, simply post in the comments. As a teacher I struggle to make time for exercise. I had a great plan at the start of the school year to get up and workout before going to school. I have a 30 minute commute so I found it very difficult to workout, get ready and to be at school in time to do paperwork. I am a SPED teacher so I have tons of paperwork. I found if I go in to my classroom about 30 minutes early I can get my paperwork done so working out went by the wayside. My husband gets off work at the sametime I do so when I get home besides being tired I tend to spend time with him rather than working out. I am excited to try something new. I think the food ideas, the exercise programs, the incentives, and the blogs will be fun. I tell myself that I can do 5 minutes of exercise, once I get started, it is easy to continue to at least 1/2 hour. Getting started is sometimes the hardest thing to do first thing in the morning, but I am never upset that I made myself do those first 5 minutes. Make one small decision each day. For me, I order side salad instead of fries. Or I drink water instead of another cup of coffee. One small decision at a time. I do and teach Tai Chi. I doubt there is a better program of movement that is it’s equal. I recommend it to everyone. There should be someone in your area that teaches. If not there are a lot of videos on you tube that will get you started. Your infographics are great! I’d like to see one for vegetables that fight cancer. It is thought and what they want to offer than just calling functions. This game is fun, and had to start thinking about using mobile games one can play games. internet. Large space needed for high-quality games easily in the year of release. In comparison to the test of time. Once the theme of the code. จะได้เห็น มัน พัฒนา เมื่อเวลาผ่านไป . I work for a multi branch medical clinic in Portland, OR, where a few of us bike commute on a regular basis. However, our management has not done much to encourage this as we do not even have a locker room to change in, instead we have to use any availble bathroom, which leaves a lot to be desired as far as cleanliness and space. We do have a small uncovered bike rack that was only put in about 3 years ago. Our attempts to have covered bike parking and a small, clean place to change have both met with resistance (our management seems to be very “old school” especially when it comes to alternative medicene and prevention, ie diet and excercise). Can you as our new insurance carrier, do anything to help them make the connection between healthy/active employees and savings in health care costs ? or perhaps you could offer incentives to us as induviduals, since we as healthier customers will also be saving you money as well ? I whole-heartedly concur. Our employer has an employee-driven voluntary protection program and sponsors early morning stretch sessions and the company as a whole has benefitted greatly! I also wish they had lockers and a change room. The restroom has a shower, but it’s all very small and not user-friendly. Safety and health promotions pay off in spades! They add values to our work culture, add value to the people who participate, and save money for less claims and incentives. Great to hear that you and some of your coworkers are commuting to work by bike. What a great way to incorporate regular exercise into your day. Keep up the great work! You’re also spot-on in thinking about the benefits to both employer and employee in promoting wellness at the workplace. Supporting the health of employees can help to reduce absenteeism, enhance on-the-job performance and decision making, improve worker morale (resulting in lower turnover) as well as decrease health care costs over time. At PacificSource, we offer resources to help employers design a short and long term wellness strategy that’s tailored to their work enviornment and includes input from their employees. We’re happy to provide your employer with resources to get started or continue their efforts, including Winning at Wellness, our guide to developing a successful workplace wellness program followed up by a monthly wellness toolkit. To learn more, your employer can contact our wellness team at wellness@pacificsource.com. In 2012 Pacificsource sponsored a 3 month weight loss program with Scott & Brad Lamm & the “Just 10 LBS” book in the Boise office. I really enjoyed partipating in the program and lost almost 30 lbs as a result. I had really hoped Pacificsource was going to offer a follow up program to motivate me (and others) to reach my goal. Are you aware of any such plans for the future? Thanks. So glad to hear that you had such successful results from the program! I checked with our Wellness team in Boise, and it sounds like that program was a one time program, but we still offer a variety of our wellness programs that have a focus on weight loss. If you’d like, I’d be happy to get you in touch with them. Just shoot us an e-mail at MillionIdeas@pacificsource.com and I’ll get you a contact. The trend these days for doctor’s offices is “Patient Centered Medical Home” which is a great concept that will hopefully foster continuity of care and integrate medical, dental and mental health services for those who need them. However, to be ‘patient centered’ sounds great on paper but no one told the pt! The pt needs to take charge of their health, preventative and illness, educate themselves, ask questions of their clinical team, keep their appountments and follow the recommendations of the clinicians caring for them. I’ve read all the posts here and there are several folks who don’t want to take pharmaceuticals – then don’t go to a medical doc, go to a natural healer! Don’t go to the drug store, go to the nutrition store. I know, you’re going to tell me that the MD is covered and the alternative medical healers are not…then cancel your covereage and use the healer you want. We all have choices to make about our care and how to spend our money, we are all on a “fixed income” not just the elderly. Make your choices but educate youself. Even those who work in the healthcare industry know that it is broken. Trust me when I tell you that many who work the industry (and for sure aren’t making the big bucks) have great ideas to make it better but those who are running the biggest programs are not asking the right people, or the right questons and believe that “comment periods” on new legislation are a joke. This industry is broken beyond repair, replacement is the only option. Until many folks wrap their heads about that, we will perpetuate the brokenness of Medicare, Medicaid, expansions of these programs and the misuse of millions of dollars that could cover far, far more people that it does currently. I have a hard time understanding how I have to pay $75 for my 30 day supply of diabetes test strips, yet when I call in to ask about this, I’m told I could actually get the equivalent of 5 months supply for $150. I just have to order by mail. Really? Without knowing your specific plan benefits, we can only say that in general, many of our plans make it cheaper for members to use mail order services for their prescription medications. With test strips though, it’s hard to say what a month’s supply is, as many people need to test more often at some periods in their life, and then less often at other periods. Test strips do expire though, so if a person needed 100 this month, it doesn’t always mean that ordering 500 would be a good deal – because that may or may not be a five month supply. We’d be happy to talk over some specifics of your plan (if you’re a PacificSource member). Could we get an email or phone number so we can contact you directly? We’d be happy to describe the mail order program and see if you can save money that way. I’m used to a plan that with mail order, provides 90 day supplies for 2 co-pay payments, saving one co-payment. My plan with Pacific Source does not do that. So I had everything moved from CVS Caremark to Wal Mart. But now my supply of 100 test strips (30 day supply) costs $75. I wasn’t paying that much for my previous 90 day supply. And I’ve found out today that a medication I’ve used for about 2 years (which PS requires pre-authorization for) has been turned down. Is there a way to provide my phone without is posting? Empower Health Informatics. Control the power of modern technology to enhance health care services for the general public. I would like to see insurance companies freed from having to offer mandated benefits like mental health counseling and treatment for substance abuse in their health care plans. I am guessing that these types of benefits are mandated and are driving up the cost of premiums. I am a registered nurse working in health care. I am involved in the transfer of patients from acute care facilities to a rehab. facility. Every holiday is problematic because most insurance companies shut down the day before the holiday. Often , (like this past Thanksgiving) they are unavailable to do transfer authroizations for 5 days. Then on the Monday when they reopen the phone lines are jammed. In the meantime patients continue to linger in a (more expensive) acute hospital setting when they could have been well into their rehab. program, designed to get them home! Parents can warn their children of advertising and marketing gimmickry which targets them as consumers. Children want what is popular ( sugar sweetened beverages are popular) and ,restrictions on other harmful to public health products such as tobacco, have been implimented so let us align sugar sweetened beverages and tobacco hazards as advertisement awareness. Readily available fruits and vegetables are great. Farmers markets in convienient store lots and more. How about allowing, through working with the Public Administration Health system, regulations on sugar sweetened beverage producers, who spend over a billion a year on advertising, to have the “option” to invest in urban fruit and vegetable growing and distributing centers ( high rise buildings with current functional deigns) which would supply the juice to essentially eventually replace to some extent the overwhelming availabilty and popularity of the sugar drinks, especially those sugar sweetened beverages which target children causing massive medical carries and other mind and body negativisms. I’m wondering if it’s not now time to look at the compensation for “those at the top”. If we’re to be generating ideas for cost savings, and employees are to be designing strategies to implement them, what exactly could be the percentage decrease of these unneeded expenses. My employer looks at me as an expendable unit, while crying about “taking care of” me. How about applying that yardstick with those whose duties in “leading” healthcare organizations will now apparently be decreasing as well ? Why the big bucks in an atmosphere where the consumers and the “little guys/gals” are the change makers ? Could save millions over the years ahead, millions that could go directly into lowering the price of insurance, soothing my employer some. We operate a small manufacturing company which has always provided medical/dental insurance benefit for all permanent, full-time employees and their entire families. This highly valued benefit translates into employing people who try to take care of their families and take care of their company. Unfortunately we see many employees who do not have a good understanding of how best to use the medical system in a proactive way, to benefit their health … which translates into reducing the costs for medical healthcare on a company, system, state, country wide basis. We would like to see the insurance industry take on the challenge of helping to educate our employees and their families on how best to use the systems available. Many of our employees have never been around a medical situation unless it is an emergency. Many do not have their own doctors or come from a culture of being proactive. We would like to see company wide training seessions for our employees to get them through the barriers presented by such an impersonal medical establishment. Perhaps have employee plus family meetings to insure people are enrolled with doctors, signed up for annual physicals, are getting the hang of it, etc. Get people into a proactive stance; currently many need to have a gentle nudge. Good evening and thank you for asking. I am a physical therapist, with more than 30 years of experience. I have written Your Body Book, Guide to Better Body Motion with Less Pain. It is a self-help health care book, written for the general public. It provides a brief head-to-toe review of anatomy, problems/solutions, offers health tips and illustrated exercises to decrease pain, increase motion, improve strength, and overall function. With this knowledge we can decrease fear, stress, and worry, and can save literally hundreds and thousands of often unnecessary health expenses. One frustration with current colonoscopy coverage is that they are only covered at 100% if nothing is found. If you have any polyps, even if benign or small (as most are), the coding changes to diagnostic and there are significant out-of-pocket costs incurred by the patient. Isn’t the point of the colonoscopy to “catch and remove” polyps before they can cause any problems? It seems backwards to only cover procedures that were, in effect, unnecessary as there were no findings or true preventive care done. Unless this policy has already changed, can you clarify why you financially “punish” people for getting truly preventive care which can save lives and save thousand of dollars in cancer-related treatment? Thank you. Exactly! They make money off doing colonoscopies because many people have harmless polyps which are promptly removed under the guise of ‘could turn into a cancerous mass’. I am financially punished for refusing a colonoscopy. I believe there to be no reason to put something in my out door, that could scratch or puncture in the process, unless I have a problem. Sorry. That’s invasive and shoud not be required to keep costs down. I’m good with all else, if they must. There’s much controversy about colonoscopy…. Encourage people to get genetic testing, perhaps by partially covering the cost of the test, or by negotiating a group rate with the testing company. I know the science is still in its infancy, there are serious privacy issues to be addressed, and it’s not a cure-all by any means, but it can be help spot potential problems long before they are manifest, and allow people to plan tests and possible treatment options. For example, the company 23andMe tests for disease risks and drug responses (I have no connection with them, other than using their service, and I am sure there are others out there). When you look under “Drug Response” in the information provided, they have things like “Response to Hepatitis C Treatment,” “Warfarin (Coumadin®) Sensitivity,” “Abacavir Hypersensitivity,” Clopidogrel (Plavix®) Efficacy,” and so on. A doctor that knows you are genetically predisposed to Warfarin sensitivity will be able to start treatment at a lower dosage (or perhaps use another drug), and keep closer watch on potential bleeding problems. Of course, there are many people who would not want such a service even if free, but for those that do want it, it would provide an incentive that may allow them to take a more proactive interest in their own health. And the Genetic Information Nondiscrimination Act does provide some basic protections that address many people’s concerns. By knowing what drugs a person may be sensitive (or insensitive) to, doctors can design appropriate treatments earlier, leading to lower health care costs and better outcomes. This might be difficult to implement, but then again many good things require hard work (grin). I know, the obvious response is that I should just get a new PCP. First, I work full time, and the last thing I need right now is to shop for a doctor. A doctor – patient relationship is a sensitive matter, and I don’t want to get a new doctor by random process, and I don’t really want to start trying different doctors so I can see my dermatologist. I also don’t really want to leave the PCP I have. I actually find this situation to be rather stressful. Pacific Source publishes nice statements regarding the importance of reducing stress. Or did I read it wrong? Did they say INDUCING stress is important? Can someone tell me the reason for this new policy. Do you not trust the integrity of my dermatologist when she says I need treatment? Seriously, please do respond. Thank you. We want to be very careful not to disclose any of your personal information online. Since there are so many things that factor into patient referrals and selecting a PCP, this probably isn’t the best forum to discuss it. However, if you’d like to discuss this in a little more detail, feel free to e-mail us at MillionIdeas@pacificsource.com. Thank you very much for weighing in! 1. STOP PUSHING FLU SHOTS. The aluminum, mercury, formaldehyde & MSG found in flu shots & vaccinations are not going to save the insurance companies any money. There is more & more evidence mounting, that flu shots & vaccinations cause more problems than they help with, including huge lawsuits against Big Pharma companies. 2. EDUCATE PEOPLE WITH TRUTH. The medical industry is one of the most corrupt, because of all the money at stake. The mis-information is life-taking. 3. CURE CANCER. There are many natural/alternative treatments that actually reverse & prevent cancer, such as detox, raw foods diet, etc. Chemotherapy is worse than doing nothing, as it has a 95% FAILURE rate. I completely agree with the comments of both Tim and K.J. McElrath. It is painfully obvious that the only way out of the mess we are in is to completely abolish the for-profit health insurance industry, and switch to a single-payer government-sponsored plan, which is the way healthcare is delivered in virtually every other country in the developed world. In other words, we need to do away with companies like PacificSource, which only exist to generate profit, and find that the most efficient way to do that, of course, is to deny access to healthcare and to make it as expensive as possible. It ain’t rocket science. But it will never happen because they have wisely invested a portion of their massive profits in controlling the political process so as to ensure that their morally corrupt business model escapes any real scrutiny, let alone reform. You can’t “reform” a system that is totally broken. Define what “basic healthcare” is w/respect to what should be covered under “national healthcare” and what is “elective care” covered by the individual or their private insurance. Not every situation or condition can be covered by a national healthcare system. Get realistic about what is essential and what is elective. If you sign up for “free” care, you waive your rights to sue. This is done in N.Z. Torte reform is an obvious start in USA. Develop a national coding system to streamline the administrative nightmare from state to state, clinic to clinic, etc. Develop a national data center (N.Z. has one) so that no matter where you are, your medical data and history is accessible in medical situations. Truly “portable.” WA state started this w/Provider One software. I’ve moved many times and each location, each doctor requires the same tests to be run and the continuity of care is broken w/each move. Increase the number of “neighborhood/community/school” urgent care centers where non-life threatening incidents can be handled by P.A.s or others appropriate to the situation. Understand that “insurance” is not the same as “healthcare”. Access to insurance is not going to solve a thing. Access to healthcare at tiered levels can. Quality care does not necessarily mean expensive care. You share some interesting and thought-provoking suggestions, and your last thought – “Quality care does not necessarily mean expensive care” – is absolutely spot on. While it’s not always visible, there is a strong undercurrent of work happening through many of our communities that involves several of the ideas you suggest. Health plans, hospitals, and doctors are collaborating in new ways to restructure the way healthcare is delivered and paid for. The goal is to reward cost-effective, high-quality healthcare that results in better outcomes for patients, and achieving that relies on shared medical records, greater use of physician assistants and nurse practitioners, and similar strategies. Just out of curiosity, are you from New Zealand? And, if possible, can you share some credible sources for more information about how New Zealand handles healthcare? If we can find some good contrasts, we’d like to do a blog post that compares the American system with New Zealand’s. Great ideas, thank you for sharing them with us. Our society needs a dose of tough love. Self-inflicted health problems should not be covered by insurance, medicare, medicaid, etc. For example, if I smoke and develop lung cancer, that should not be covered. If I am more than 20% overweight and develop diabetes, that should not be covered. For some reason Americans think they can live as they please, and someone will “bail them out”. That usually amounts to the rest of us paying for others’ bad habits. We need to tell them Sorry. The thought behind the campaign was to put blame on our society for leaving an unhealthy legacy for our future. The ads generated a lot of controversy, but seemed to resonate with a national audience. Based on the thoughts you shared with us, we’d love to know what you think about this kind of advertising. It’s no secret that unhealthy lifestyle choices have a big impact on healthcare, and promoting healthy living is one of our main objectives in improving the system. We’d love to know, from your perspective, what tactics could we use (as a health plan) to make things like quitting tobacco, exercise, nutrition, or stress management stick? Thank so much for weighing in! I think healthcare needs to be more proactive. One of the biggest things they should cover and encourage is physical activity. Cover gym membership fees to offset the high cost of excercising in areas where there’s no safe place outdoors to do it. Focus on preventative strategies to make sure that future generations are healthier than today’s. Hi Jamie, your idea is fantastic. Finding ways to bring convenient, affordable exercise to the public is something we’re always trying to achieve. Partnering with local gyms, recreation facilities, or parks is something we’ll continue to explore. Take it one preventive step further and encourage & support corporations and businesses to have P.E. sessions, a workout space, or stretch, walk, and balance sessions each day. Our company has adopted allowing us to attend small sessions to benefit our personal selves and it boosts morale through the roof!!! I am a pharmaphobic, a term I’ve coined. Every day I am told to ask my doctor about this, that, or the other drug. And the side-effects. And the ‘let’s try this or that’ attitude. Multi-million dollar business, I’m sure. Doctors who can document a high rate of patient satisfaction (independent surveys) should pay less for mal-practice insurance, and with every year they’ve not had a claim, as well. There are great doctors out there, who give no-nonsense advice and take the time to make an informed treatment plan, rather than being allowed to take fringe benefits from the companies pushing their drugs and getting by with a 4-minute consult and a prescription. Dental care is highly under-evaluated. Far-reaching results of the missing dental care between 18 – 30 year old people is devastating to overall health! They are just getting started, trying to support a young family or pursue a career, and their mouths are hurting and their teeth are rotting. Why? Because they are in the biggest group of folks who cannot afford dental isurance or even the deductibles. Choosing between gas to go to work, insurance, or food… that’s where millions of young adults are. I am most amazed at the results of big pharmaceuticals’ marketing. The masses just eat it up. Take drugs for life. Never mind the side-effects or the outrageous costs. Why market medicine? If it work, doctors will prescribe it. Patients don’t need to be innundated with that, yet they control the media with their huge profits. And – what happened to doctor-patient confidentiality? I no longer receive a document with the doctor’s findings. Only a ‘statement’. No explanation. Pacific Source, I have faith in what your initial premise and objectives promised. Make it better! Make Sense! Balance the Benefits! And – train people how to take care of common stuff. Cuts down on claims. Cuts down on expenses for those who can’t afford to visit the emegency room for every little owee. Educate! Thanks for this forum. There are solutions. It takes a lot of thought by a lot of people. People not out for ultimate profits and hoping to leave a footprint of having made a difference. It would cost les, really. 2 things, limit the engagement of insurance companies with my care. I know what I need way more than any insurance company who’s sole existence is to make a profit off of the sick and dieing. My evaluation of the situation is that insurance companies and pharmaceuticals are partnering to determine just how much money can be made off of a patient and how much it will cost them. The answer is any cost to save life. Cut your CEO and C-level wages and maybe you’ll have enough to actually care about the patient. Include naturopathic coverage. Some of us value our health in such a way that pharmaceuticals are not considered a cure. The objective is to heal not medicate yet insurance companies solely rely on pharmaceutical companies for direction opposed to 3000 year old tried and true remedies. GET THE DAMNED PROFIT MOTIVE OUT OF HEALTH CARE!!! NIOTHING WILL CHANGE AS LONG AS A CORPORATE BOTTOM LINE DETERMINES WHO LIVES AND WHO DIES AND THE BLOOD SUCKING ***** WHO MAKE BILLIONS ON DEATH AND BUY AND SELL THEIR ****** IN CON-GRESS ARE IN CHARGE!! Understanding your rage – but shouting with caps doesn’t help. Don’t complain unless you have thought of even the smallest improvement to propose and represent. It has to be sound. It has to make sense. It has to help a majority of a group of people without incurring additional cost. Replace one costly thing with another, more effective, less expensive thing. Investigate. Eduacate yourself. Only if you know the system, can you utilize the system to serve your interests (and probably that of many). Oh, and vote. I want to know the cost of a doctor visit so that I can make a cost effective choice. In other words, am I seeing a doctor that charges $25.00 per visit or a doctor that charges $50.00 per visit? After all, some doctors are better than others and as a customer I need to know more information to make an informed decision. Competition will help to drive down costs. Hi Stephanie. Thank you for your post – as it happens, I just wrote about this topic! I think there’s some things there that you might not have heard before. There’s more than just finding out what each doctor charges, it’s also important to find out if that charge is within the normal range. I also mentioned that I am rather shy about asking my doctor about fees. Any ideas? Have you ever done this before? If so, how did it go? Never be afraid about asking a doctor what the charges are! Never! I never had an ingrown toenail. I went to doc in the box (acommunity care/urgent care/we are here for you outfit). The doc told me to soak in soapy warm water and try to get uder the nail. He prescribed antibiotics. Itook them. A week later I went back with a badly irritated throat… turns out the antibiotics caused a massive fungal infection. So now two $110 visits. Toe not fixed, cause I’d scream to touch it. Went to foot doctor. Had matrixectomy. Much better now. But – count the first wasted visit and the fungal infection, the cost for the second visit to battle the cause of the fungal infection…now there’s waste I bet is repeated a hundred thousand times a day. Be informed, do research, ask questions! Take someone with you to witness your questions. I think we need to change our perceptions of health. Advertising these days tells us if we feel pain we should take a pill which will fix it. The truth is that it only takes away the pain but doesn’t address what caused the pain. I also think we need to take greater responsibility for our health and the way our psychological make up contributes to our physical experience. This may sound a bit far fetched to some people but you only need to think about times in your life when you have felt great and everything works in life. The reverse is also true. Love what you are doing here! Thanks for being the first to share an idea, thewayofthechiro! This is exactly what we had in mind. Have a great day! I agree 100%. We need to educate ourselves. All information is available, but it needs to be sorted out by credibility. And we need to understand that pain is an indicator of something wrong. Find the cause instead of covering it up with pharmaceuticals.